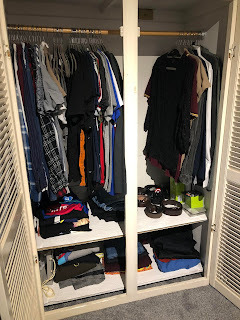 You may remember from my previous posts (building a wardrobe that is me part 1 & 2) that I was trying to create my ideal wardrobe, one that captured my style and personality perfectly. But once again I am at a crossroads, my style seems to be constantly changing although I am at the stage where I am between two main ones, one being smart the other been more of a streetwear style. I want to venture more into my smarter style but I am struggling to find items that fit my current body shape that fit this style. Therefore lately I am mainly wearing my printed t-shirt with a jacket or hoody thrown over the top. The above image is the current state of our wardrobe, we share and all my items are on the left with Liam's over on the right, I also have 4 piles on the shelves. Which is far too much for what I actually wear. You will find me in a Levi's top and skinny jeans or just a plain top and skinny jeans half these items still have the tags on as they are too small or they just don't jump out on me whilst I am trying to put together an outfit. I know what my ideal style would be t-shirts layered with shirts, knitted jumpers and shirts (smart and casual) with skinny jeans in the winter and chinos and shorts in the summer. That is why I am going to try be more careful whilst shopping, only buying the parts I require or know I will get my money worth from, there is no point me wasting my money anymore, I may as well save it for work in the house or treating myself to something I really want. Plus it means less waste in terms of clothing those clothes I buy for the sake of it others could really benefit from so there is no point me getting it just to look at. In terms of the clothes that are too big I aren't going to wear them again as I aren't planning on gaining weight anytime soon, I only want to get rid of it. I will keep a few of the bigger items though as there are a couple that look quite good oversized. In terms of ones that are too small I will be going through seeing what I will wear as I drop sizes and if I have no intention of wearing them then they will be gone to free up space. I will be doing a wardrobe clear out soon and items will either be getting donated or passed on to family if they want them. I am just at that point now where what is the point in keeping things if I aren't going to give them the time of day, but the items that do get kept I will be making sure I try mix up what I wear. Shopping trips will be reduced and more thought will be put into any future purchases it really is now time to work on my style and what I am comfortable in for a change and I will definitely be taking more pride in what I look like. Who knows I may experiment more with the items I love when I loose weight and get more confident.